I’ve learned along the way that some people hoard and hover over their recipes, keeping them secure in a vault, never to be shared. I like to think I understand that, but no, not really. I don’t. I’d rather share the love. Isn’t that what it’s all about? I’d rather have gotten the cinnamon roll muffins my grandma used to make that everyone loved than to conjure the taste of a memory. My grandma shared her recipes, but to an extent, we took it for granted that one of us had it penned to paper. It was one of those recipes she’d perfected to memory, never needing a written recipe to refer to. Grandma’s been gone nearly a year now, but dementia thieved those recipes long ago. This recipe is a treasure. I’ve safeguarded it for years because it was special to me. Letters strung together to form words, instructions, typed, e-mailed and printed. Nothing fancy, really, but the story behind it is what gets me; another reminder that food naturally lends itself to memories. Predominantly good ones, but I can also think of a few that weren’t, but that’s how life goes. Years ago, I worked for nearly 8 years in the HIV field as a case manager and I loved it. Loved the experience, loved the people. I had both of my daughters while I worked there. One year, we implemented an onsite peer support group for patients on Tuesday afternoons. Ben was a long term patient and advocate and became a mainstay, volunteering his time, bringing homemade cookies like this one, and wisdom to those who were new to the knowledge of their diagnosis. Shortly before I was to be gone on maternity leave with Leah, we learned we were awarded a housing grant to assist people with housing needs. I suggested to Ben one afternoon, that he fill in for me while I was on maternity leave, give him the chance to try on the working life again before taking the leap into becoming the director of the housing program. He jumped at the chance after years of being so sick and on disability, it gave him the opportunity to put his MBA to use. Meds had come a long way and for once in a long while, he felt good, stable. When I returned to work, he was ready to transition from filling in for me to heading up the housing program. It worked out beautifully. 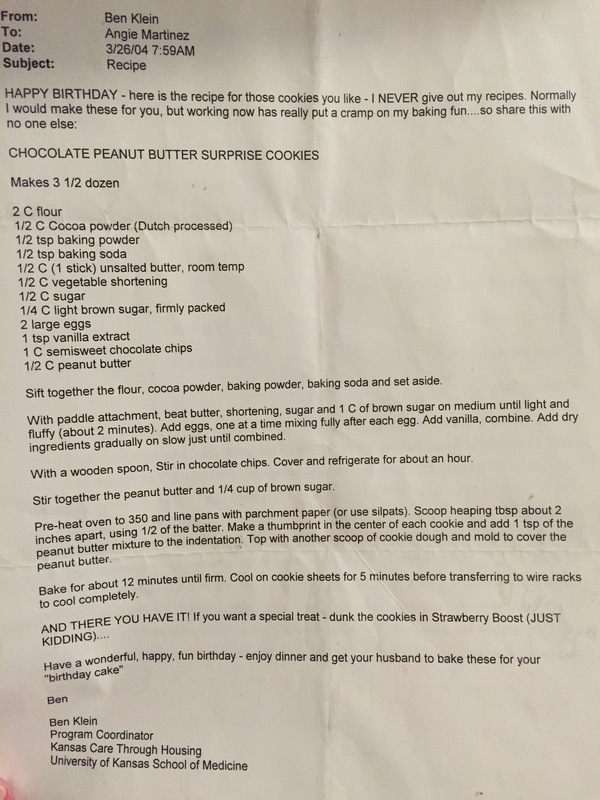 The following year, he remembered that I’d enjoyed these cookies he’d brought in during his days of volunteering, and sent me the recipe, albeit a day early, for my birthday. Later that year, when I decided to return to school to obtain my MSW, working in the medical clinic didn’t allow a flexible schedule, so Ben invited me to lunch at Da Nang (a very questionable restaurant, in which I had to routinely remind myself I was supposedly eating chicken) and suggested I come work for him as a housing case manager, and I did. That year for Christmas, I did my usual holiday baking and gifted him a bag of goodies. I remember the delighted e-mail he sent about how he so enjoyed the turtle cookies, the caramel stuck to his chin. Two years later, on my scheduled day off so that I could attend classes, I received a call that Ben had died. A massive heart attack. Just like that. Here one day, gone the next. I later transitioned into his role as the director of the housing program where I quickly learned the corner office with the view isn’t always what it’s cracked up to be. I’ve had this cookie recipe for 11+ years and made them for the very first time a few weeks ago. Truth be told, it wasn’t the cookies that I savored so much, it was the memories.